Tin đăng trong 'Tiếng Trung Quốc | Chinese Language' bởi admin, Cập nhật cuối: 19/07/2018. This is an invaluable study guide for learning basic Chinese characters. 250 Essential Chinese Characters Volume 1 is a second edition, completely revised and with 50 percent new material. Featuring a new design; tips for mastery throughout; exercises in AP-exam format; progressive review sections; and several indices, this volume is a crucial learning tool for anyone interested in Chinese. Master each character's radical, stroke count and meaning. Grow in proficiency by learning compound words. Example sentences show how to use them in context. Review activities reinforce your leaning progress. Helpful writing guides and practice grids for every character. 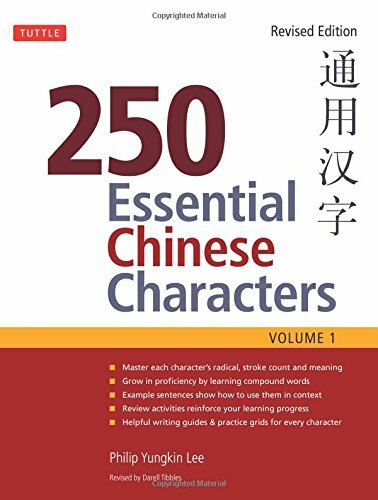 After studying this book together with its companion, 250 Essential Chinese Characters, Volume 2, you'll have learned 500 of the most important characters in Chinese, and thousands of words in which they appear. Whether you're new to Chinese or coming back for review, each of these 250 characters offers you ways to improve your Chinese skills.